We all know we should eat more fruit, but just picking up a pear and cramming it in your gob is just so... unsatisfying. 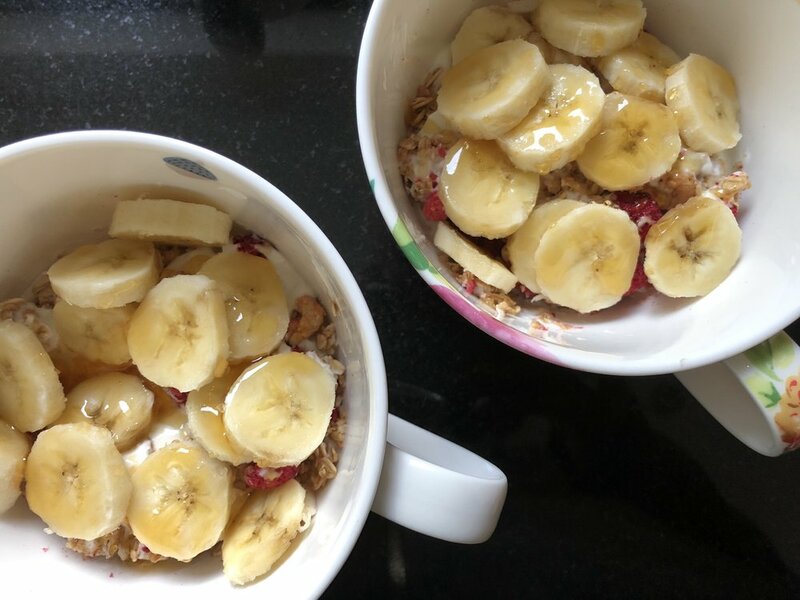 So, we (Rosalind and I) decided to challenge ourselves to come up with five tasty ways to get more fruit into our days right from the off - by stuffing our breakfasts full of the good sweet stuff. Here is what we came up with. Monday - Mango, Melon, Yoghurt and Honey. Not very complicated, this one. Chop up mango and melon. Drop them onto a blob of natural yoghurt and drizzle with honey. This was Bulgarian forest honey from Woolwich market. It felt like summer had arrived. Hipster millennials that we are, we couldn’t resist smashing an avocado onto some toast, and drizzling it with some kind of spicy condiment. A mid-week sweet treat. Ros and I love Nutella with a fervour. 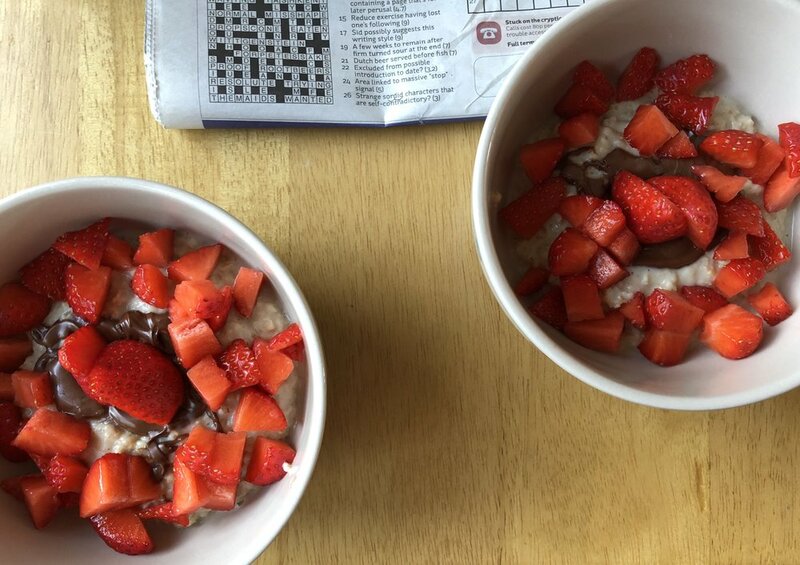 To replicate this recipe, make porridge (really well), stick a spoonful of Nutella in the middle, and then coat with lots of lovely British strawberry chunks. 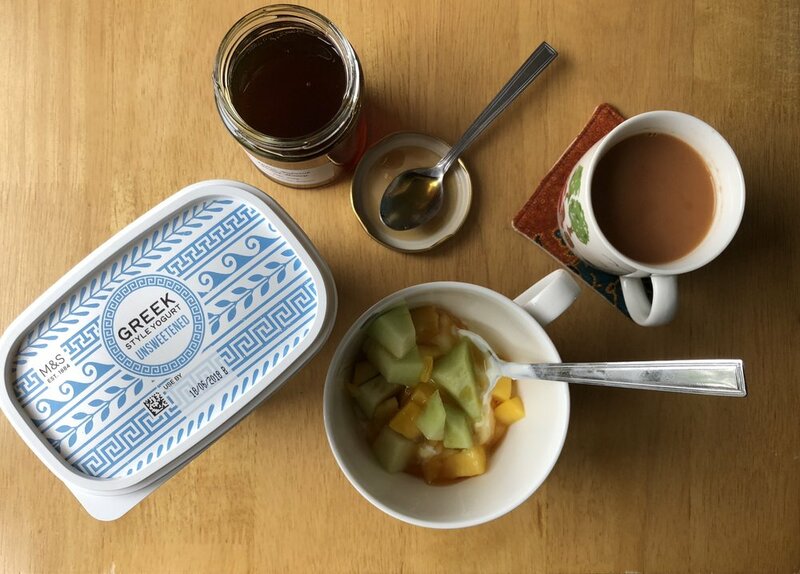 A variation on the yoghurt/fruit/honey theme here. We had a lot of honey last week as my hay fever was especially horrendous. It was an effort to boost my immune system. It certainly tasted nice if not. Here, we blobbed some yoghurt into a bowl, scattered cereal over, followed by chunks of banana, and drizzled with honey. Anna Jones is the writer of my absolute favourite cook book, and her recipes have really changed my cooking, especially since going vegetarian. This one is hers, and requires a little more investment in your morning. It was a great way for us to see off the week. Make porridge, and whilst that’s cooking, stick a load of blueberries in a pan with the juice of a lemon, a pinch of cinnamon and a tablespoon of maple syrup. Put them over a medium-low heat. Once the blueberries have softened a bit, smoosh some of them up with your wooden (or other) spoon, and let it cook away along with your porridge. How would you get fruit into your week? Do you have any recommendations?